Who said the snake picked on the spider? It was caught in a web. The snake is tiny - I was expecting something much bigger! Raggamuffin wrote: Who said the snake picked on the spider? It was caught in a web. The spider is ten times smaller at least. It would be like going up to an elephant caught in a man trap, and trying to bite its leg. Would you do that Rags? @Thanks for posting Wolf, that was really cool to see. The spider is about the same width as the snake though, and the snake is stuck in the web. I would say the spider had an unfair advantage! It's nature...survival of the fittest. Nothing unfair about it. It is what it is. Snakes don't bother me, I have a pic of a huge one round my neck. I would prefer 10 of them to a little bitty spider. That snake is a baby.. The spider is maybe 3-4 cms wide (their body is usually anywhere between 3 and 4 mm, up to maybe 10-12 mm for big old gigantic mean females -- the rest of their size being in the leg span..). The snake is obviously young -- mature brown snakes are from around 90 cm (3 feet..) up to a couple of metres for some big old granddaddy/grandma specimens..
Redbacks don't build big strong webs, so that a bigger and older snake wouldn't be trapped. Back in the mid-80s, while on holiday up on the far north coast, I rescued a baby 'Small scaled' snake (only about 15 cms/6" long) from a redback's web and released it next to a nearby creek. On checking up the type of snake later on, I found out that the adult (only around 40--60 cm long when fully grown, and relatively rare), is one of the most toxic snakes in the world ! However, because of it's scarcity, and being less aggressive than some, less people are bitten by Small scaled snakes, so they are further down the "dangerous" list.. I prefer snakes to spiders, I'm terrified of them. magica wrote: I prefer snakes to spiders, I'm terrified of them. She said she prefers snakes so wouldn't you have posted a picture of a spider? eddie wrote: She said she prefers snakes so wouldn't you have posted a picture of a spider? Now why would I want to scare lovely Mags Eddie....do I really seem that cruel? little ones tend to have stronger poison. Even the sight of a house spider makes me feel physically sick, and that is the truth. Mags and Eddie....you are forcing me to bring the big guys in. Which is unfortunate because I'm knocking myself sick now. I wonder how Syl would feel about some of those giant pythons found in F. N. Queensland, Indonesia or Burma (those that can grow up to 9 metres in length..)..
Or how about coming face-to-face with a 2 metre black snake, a Taipan, a King Brown, a Death Adder or maybe a Tiger snake ? I have already said...I don't have an irrational fear of snakes. And the Taipans, King Browns, Tiger snakes and Death Adders look quite a bit different to those cute and cuddly and friendly Carpet snakes and Diamond Pythons (the two varieties of python most likely to be encountered in petting zoos and snake shows down here..). Shivers, even seeing them on here I have to scoot past they make me feel sick too Syl, that and injections. Often found in houses around here, sometimes in cars as well, most people either move them outside or leave them alone..
Also are probably the most popular for filming for "horror" movies, because they film well and are aesy to "wrangle" on film sets -- but still look noce and scary on film. 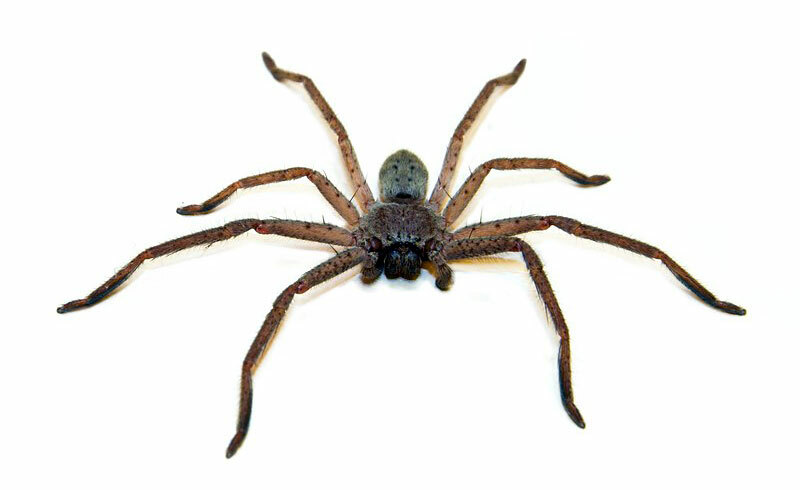 I saw the Huntsman when in Australia Wolf, it was huge, scared the life out of me, especially when told it was a baby! Wolf spiders are totally harmless. 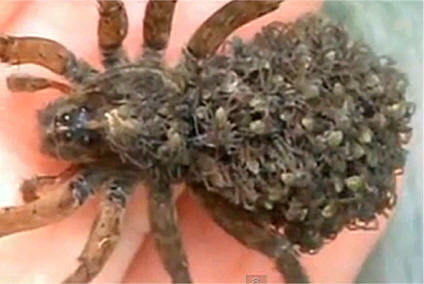 Mothers carry hundreds of babies on their backs. They used to fall into my pool in Arizona and I would rescue them with the pool net. They are great for the desert as they eat bark scorpions, which can be dangerous. Original Quill wrote: Wolf spiders are totally harmless. Mothers carry hundreds of babies on their backs. They used to fall into my pool in Arizona and I would rescue them with the pool net. I read that quick and thought you had written.... "They are great for dessert". Syl wrote: Even the sight of a house spider makes me feel physically sick, and that is the truth. This is something that people need to get over because house spiders are quite common, especially in September. Someone who has a phobia about snakes is much less likely to encounter one in the UK. No thanks....I think I might die of heart failure. You won't. It happened to me, and I didn't. That's when I decided that it was stupid to get hysterical over a spider. If there's one in your car, you need to stay calm so you don't run someone over! I have tried to conquer my fear. I studied a big one in the sink once, it was wet and I thought it was dead, so I leaned in to try to work out why they were so frightening to me. Just as I was coming to terms with it, it's legs shot out and it made a run for me. It knew...and it exploited my fear. Syl wrote: I have tried to conquer my fear. I studied a big one in the sink once, it was wet and I thought it was dead, so I leaned in to try to work out why they were so frightening to me. I used to be like you, but I decided I was going to get over it because you never know when you're going to encounter one. I can now put a glass over one, slide cardboard underneath, and put it out in the garden without getting hysterical. We had this conversation a couple of years ago and I have tried. I can put a pint pot over one(a small one) if I am in on my own, but its an ordeal, I then have to leave the room till OH comes in. That must be very inconvenient. If I know there's a spider in the room, I want it to go right away, so I trained myself to do it. I still shudder a bit obviously, but I don't feel ill or anything. It's not their fault they have big bent legs and scuttle about. I think the bent legs is the thing I hate most...and the hairy bodies, and the quickness, and the way some of them jump.... I am leaving this thread now. I can't even put a glass over it. It has the room to itself until o/h comes in, then he has to track it down. It's either that or I must watch to see where it goes. I hate this thread cos bet I see one now! I have a deep mistrust of tomato stalks, they have scared me to death on quite a few occasions, they look remarkably like spiders. I got a shoe and beat a spider to death on my kitchen floor only to discover it was a tomato stalk. Killing spiders is where you're going wrong. If you see them as living creatures which have a right to live, you'll feel differently about them. Raggamuffin wrote: Killing spiders is where you're going wrong. If you see them as living creatures which have a right to live, you'll feel differently about them. Can I kill tomato stalks? I don't like killing them, my OH does ...and tbh I am so frightened I just want them gone. A couple of years ago I saw legs and bits of spider body on my stairs....a bigger spider which I saw later must have killed and eaten some of it. This is what we are dealing with....so I don't have much sympathy for them. A half-eaten spider. Nice. Thanks for that. See how your fear is affecting you all? You need to get over it. Raggamuffin wrote: See how your fear is affecting you all? You need to get over it. Get a plastic one and put it on your pillow at night. That'll cure you. Me too mags. No one gets it. They are fast and have too many legs.